A traumatic neuroma is a benign, disorganised mass composed of axons, Schwann cells, blood vessels and fibrous tissue. It occurs following accidental or deliberate damage to the perineurium and is considered to be the nerve’s attempt at regeneration. The size of the neuroma is related to the diameter of the affected nerve trunk as well as the length of time over which it develops. Therefore, a sciatic neuroma could be one of the largest to be encountered in the body. Neuromas are one of the most common complications following a limb amputation. Post-amputation neuromas are often asymptomatic but patients wearing prosthesis may experience pain which interferes with their mobility. Pain associated with neuroma can significantly affect a patient’s quality of life. The main focus of treatment is alleviating pain. Williams  documented that patient counselling, local massage, desensitization procedures and sympathetic blockade are beneficial in some patients. More recently, Ducic et al. , and Sehirlioglu et al. , reported pain relief following surgical excision of neuroma. A 69 year old man was referred to the Plastic Surgery Department from the Rehabilitation Medicine Department with stump pain. Following a shooting accident in 1960, he had an uneventful right above-knee amputation. He had since been leading a normal active life wearing his prosthesis without any problems until 2001. He developed severe pain over his amputation stump when he sat on the edge of the bed or stood up which was relieved by lying down. He subsequently stopped wearing his prosthesis for a few months and the pain gradually eased. However, it recurred within two weeks of reusing the prosthesis. A combination of amitriptyline, diclofenac and dihydrocodeine did not adequately control his pain. Examination revealed a tender mobile lump measuring 3cm in diameter on the posterior aspect of his stump. 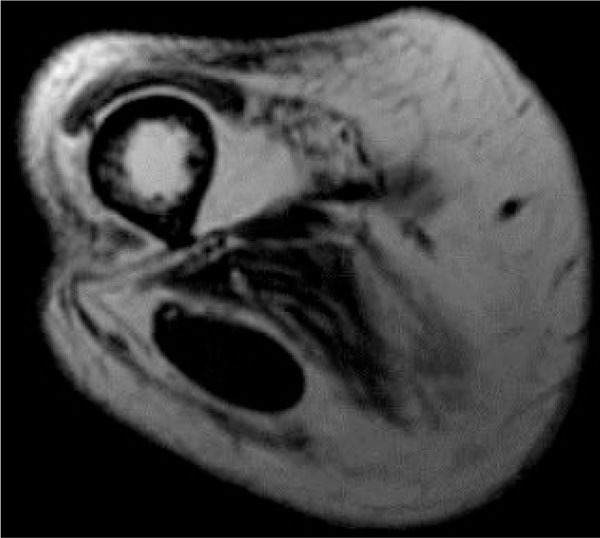 Both Magnetic Resonance Imaging (MRI) and duplex ultrasonography of his stump demonstrated a 3x2cm lobulated mass adjacent to the end of the amputated sciatic nerve. The MR signal, however, was not characteristic of a neuroma and was labelled a thrombosed vein (Fig. 1). Due to persistent pain, we planned to explore the stump under general anaesthesia. Pre operative MRI scan showing this unusual mass posterior to the femur in the region of the sciatic nerve. Six months later, the amputation stump was explored through the old scar (Fig. 2). The posterior flap was elevated in the subfascial plane revealing a large neuroma at the end of the sciatic nerve, which was then excised. The patient had an uneventful recovery and was discharged home two days later. 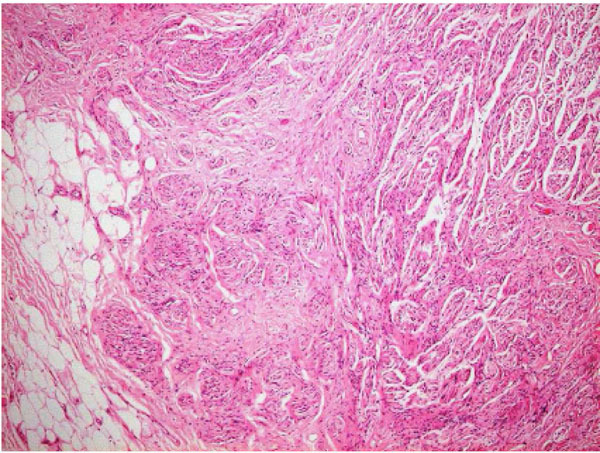 Histology confirmed the mass to be a fairly circumscribed, non-encapsulated nodule associated with nerve and composed of haphazardly arranged nerve tissue, consistent with traumatic neuroma (Fig. 3). He was followed up and remained symptom-free for seven years until discharged from clinic. Intra operative photograph of a well circumscribed mass arising from the amputated sciatic nerve. Histology of mass at x5 objective (H&E stain), showing nerves in disorganised fascicles, typical for the diagnosis of traumatic neuroma, plus some adjacent fat. Stump pain is a common problem following limb amputation. The aetiology is often multifactorial and the treatment challenging. The long pain-free interval between the initial injury and the presentation of amputation pain in this case surprised all the practitioners involved in the patient’s care. The MRI scan was useful in detecting a discrete mass and although it did not confirm the clinical suspicion of neuroma in this case, it reassured the surgeons to proceed with the exploration safely. Intraoperative findings and histology has substantiated the initial clinical assessment. Reported time delays between nerve trauma and the development of a symptomatic neuroma include 25 years in the case of an orbital neuroma after enucleation Messmer et al. and 19 years in the case of a neuroma post interscapulothoracic amputation Donnal et al. . To our knowledge, there are no reports of post traumatic neuromata developing as long as forty years after initial injury at any site in the body. The periods from the initial injury to the onset of pain related to neuromata vary in the literature from 8 days to twelve weeks and from between one and ten years (Jenson et al. , Geraghty and Jones , Falcon et al. . These variabilities may be due to differences in the size of the neuroma. Neuromas may only become painful once they are large enough to impinge on surrounding structures. Contraction of surrounding scar tissue or pressure produced by wearing prosthesis along with ischaemia and abnormal synapse formation are other potential causes. In this case, it is interesting to note that pressure may have been an important trigger as shown by the recurrence of pain on the resumption of prosthetic use. It is important to recognise causes of pain other than neuromata such as infection, scarring, bony involvement, phantom limb pain or pain relating to an ill-fitting prosthesis. In a patient presenting unexpectedly so long after amputation, malignancy should also be considered. The use of ultrasound, computed tomography (CT) and MRI in the detection of neuroma preoperatively has been widely reported. MRI provides superior soft tissue definition than CT, therefore allowing clearer differentiation between neuromata and other causes of stump pain such as scar formation, soft tissue abscesses, osteomyelitis and nerve sheath tumours. Singson et al. documented a good correlation between MRI and histological findings. Sharp et al. reported that the presence of neuroma in MRI, confirmed by histology was 96% accurate. They also reported that MRI is more accurate in identifying small lesions, less than 6 cm, as compared to USS . Ultrasound, however, is useful in targeting the neuroma for local anaesthetic infiltration as a form of pain relief in an established diagnosis. Clinical assessment still has a major role in the diagnosis of amputation neuroma, as illustrated by this case report. The authors would like to thank Dr. E. Rytina, Consultant Histopathologist, for kindly supplying the histological images. Williams HB. The painful stump neuroma and its treatment Clin Plast Surg 1984; 11(1): 79-84. 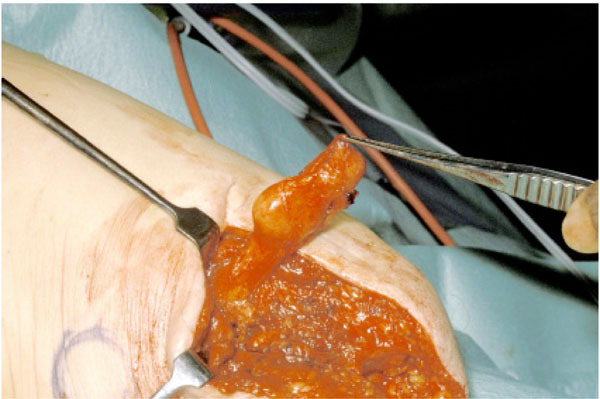 Ducic I, Mesbahi AN, Attinger CE, Graw K. The role of peripheral nerve surgery in the treatment of chronic pain associated with amputation stumps Plast Reconstr Surg 2008; 121(3): 908-14. Sehirlioglu A, Ozturk C, Yazicioglu K, Tugcu I, Yilmaz B, Goktepe AS. Painful neuroma requiring surgical excision after lower limb amputation caused by landmine explosions Int Orthop 2009; 33(2): 533-6. Messmer EP, Camara J, Bonuick M, Font RL. Amputation neuroma of the orbit Ophthalmology 1984; 91(11): 1420-3. Donnal JF, Coblentz CL, Bergin CJ. Stump neuroma masquerading as recurrent malignancy on chest roentgenogram Chest 1989; 95(3): 684-5. Jenson TS, Krebs B, Neilson J, Rasmusson P. Phantom limb, phantom pain and stump pain in amputees during the first 6 months following limb amputation Pain 1983; 17(3): 243-56. Geraghty TJ, Jones LE. Painful neuromata following upper limb amputation Prosthet Orthot Int 1996; 20(3): 176-81. Falcón CS, Falcón MMS, Villaverde RR, Solano JL, Ortega SS. Amputation neuromas after neck surgery Dermatol Online J 2005; 11(2): 24. Singson RD, Feldman F, Staron R, Fechtner D, Gonzalez E, Stein J. MRI of post amputation neuromas Skeletal Radiol 1990; 19(4): 259-62. Sharp RJ, Wade CM, Hennessy MS, Saxby TS. The role of MRI and ultrasound imaging in Morton's neuroma and the effect of size of lesion on symptoms J Bone Joint Surg Br 2003; 85(7): 999-1005.